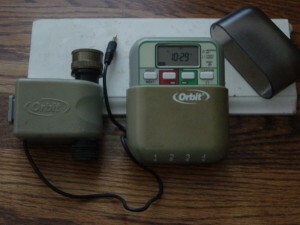 The Orbit 62035 water valve was part of a yard watering system sold by Orbit around 2005 (it has been superseded by a newer generation of valves, and their corresponding timer/controller, although it is probably still possible to find the old valves on Amazon or eBay). This yard watering system, and its valves, were sold in the United States at big retailers like Lowes, The Home Depot, and BJs. We bought two of these systems, which includes a couple of 62035 water valves and their controller (timer) to water our front and back yards, and they have been working wonderfully for about six summers. The following picture shows a 62035 water valve and its controller (click image to enlarge). Note from the picture the 3.5 mm connector and that the controller can control up to four valves. Ray, of Rayshobby/OpenSprinkler fame, wrote a couple of very nice and detailed blog posts that describe how the valve works: How to control Orbit 62035 valve and Update on ‘How to control Orbit 62035 valve’. The comments in Ray’s blog posts also contain some good information. Jay Collett created an Arduino shield, based on some of Ray’s work, that can control up to three of these valves: the h2o shield. And people participating in this discussion did some testing with the valves and even contacted Orbit technical support to obtain the specifications to operate the valves. There are two latching solenoids, one for opening the valve and another for closing it. The standard 3-pin 3.5mm stereo audio plug used by the valve uses a common contact to supply the voltage required for operation, and separate contacts for the open and close solenoids. The resistance of each solenoid was different. One (the open solenoid) was around 4 ohms, but the other (the close solenoid) had a fairly low resistance of around 1 ohm. The voltage required to operate the valves was not clear — some people thought it was 24 volts, some others claimed it was 17 volts, and then Orbit technical support claimed it was 13 volts. The original Orbit controller works by charging a 2,200 uF capacitor and then discharging it through the solenoids. To charge the capacitor, and because the controller only uses three AA batteries, a voltage booster circuit is used. Our guess would be that the exact value of the capacitor was found after someone opened the original Orbit controller and took a peek at the components inside. In one of the links above someone claims that to close the valve the controller first sends an open pulse followed by the big close pulse. The length of the pulse needed to open or close the solenoids, per someone that apparently watched the operation on an oscilloscope, was around 22 milliseconds, although Orbit technical support provided a different figure. Since the resistance of the close solenoid is so low, there is a 3.9 ohm current-limiting resistor. This was discovered after some people (Ray) opened an original Orbit controller and saw the 3.9 ohm resistors. Orbit support, supposedly, provided the following specifications for these valves: 13V, 22ms pulse and 1 to 1.5 amp current max. Armed with this information we tried to recreate the circuits that others had designed. We managed to make things to work on a breadboard, with some minor modifications of our own, but when we moved the design to SMT devices on a real PCB, things did not work. 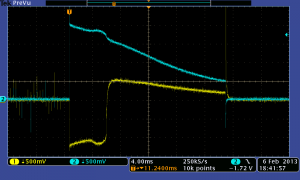 The yellow line is the voltage applied to the solenoid that opens the valve and the blue line is the voltage at the solenoid that closes the valve. 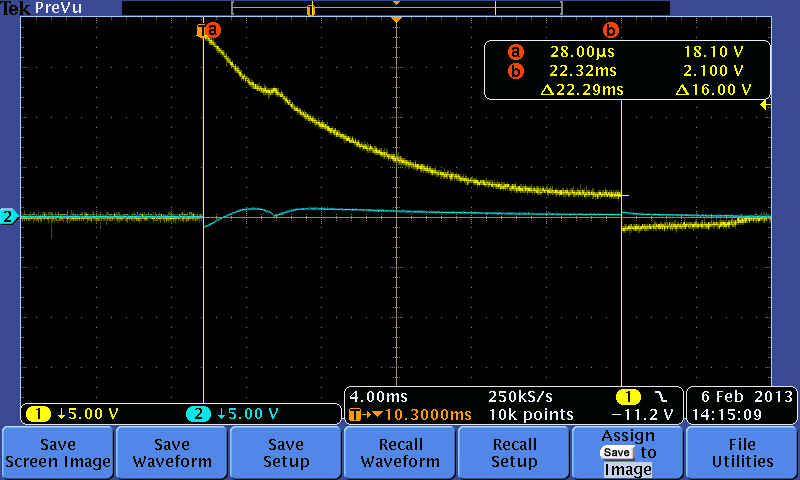 The graph shows a capacitor discharging through the solenoid (a resistance with a low value). The initial voltage is 18.1 volts. Not 24 volts as originally thought, and not the 13 volts that Orbit technical support claimed, though both voltages are close. The 0 volts across the close solenoid makes sense. Note also the length of the pulse — 22 milliseconds. The resistance we measured across the solenoid that opens the valve is 4.2 ohms, which means that at the beginning of the discharge there is a peak current of 18.1 volts/4.2 ohms = 4.2 Amps. A few things to note here: First, notice the different vertical scale — 0.5 volts/division. 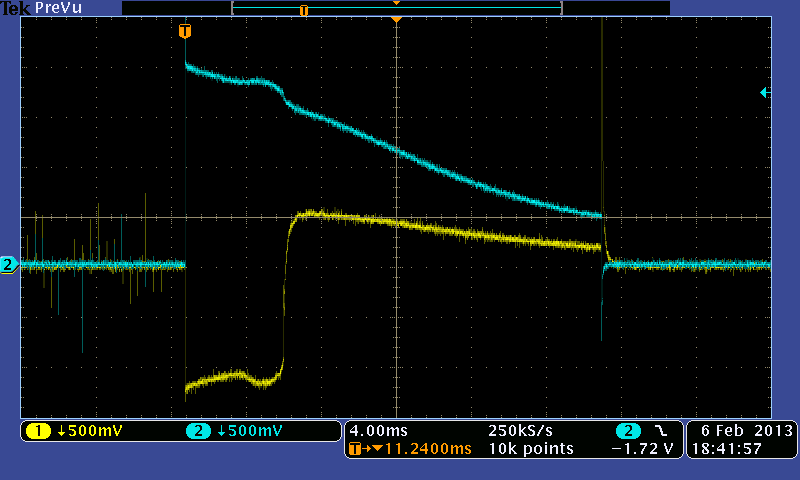 Next, note that we forgot to turn on the cursor so we can easily see the the exact voltage at the trigger point, but it is easy to see that the blue line (voltage across the close solenoid, as in the first screenshot) has a value at trigger point of 4 divisions x 0.5 volts/division = 2 volts. Since the resistance of the close solenoid is different (0.9 ohms), then at the beginning of the discharge the peak current is approximately 2 volts/0.9 ohms = 2.2 Amps. The length of the pulse is also about 20 milliseconds. This opens two possibilities with regards to the value to which the 2,200 uF capacitor is charged: 1. it is charged to a lower voltage than the voltage it is charged to in the case of opening the valve, or 2. it is charged to the same value (~ 18 volts) but there is a resistor in series with the solenoid to limit the current. (2) is what is actually happening based on Ray’s findings, i.e. there is a 3.9 ohm capacitor inside the original Orbit controller, but it would be interesting to experiment with (1) to see if in our design we could somehow (through software, assuming we can control the voltage produced by the voltage booster circuit) eliminate the current limiting resistor. Another interesting thing to note is the negative voltage across the open solenoid — this seems to be the pulse that one of the people participating in this discussion mentioned, though we are not sure it is the same thing because in the discussion the gentleman says ‘When the Timer/Controller turns a valve OFF, it first operates the “Valve ON” coil, then recharges the capacitor and operates the “Valve OFF” coil’, and we did not see this exact behavior, as the above screenshot shows. In a future post we will look at how we are planning to control the Orbit 62035 valve based on the information we have learned through the research done by others as well as our own observations. I am working on a project that requires activating a latching solenoid cialis auf rezept. I am trying to accomplish this by discharging a capacitor through the solenoid. I have the “supposed” specifications of the voltage, current and pulse time needed for the solenoid to be activated so it helps to understand the behavior of the capacitor discharge. This is Electricity 101, which I studied many moons ago, and which I remember nothing about, unfortunately. It is very common to use <a href="http://en.wikipedia cialis 20mg filmtabletten apotheke.org/wiki/Bipolar_junction_transistor”>bipolar junction transistors (BJT) to drive higher current loads. For example, BJTs is commonly used to drive LEDs, electric motors, relays, etc. When using a BJT to drive a higher current load a resistor needs to be put between the signal driving the transistor and the transistor’s base. The purpose of this transistor is to limit current going into the base. 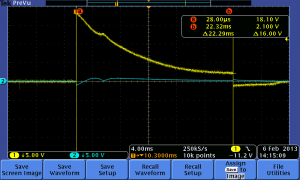 The resistor’s value is important and should be calculated depending on the circuit’s operating parameters and the load the transistor is driving. Finding the parameters needed for this formula (which are very well explained at the top of the above calculator page) is a great way to learn how to read a transistor’s data sheet.